My name is Megan Patterson. I am a writer, game Developer. When I was 10 I wanted to be a writer. I work as the Science and Tech Editor at PaperDroids.com. 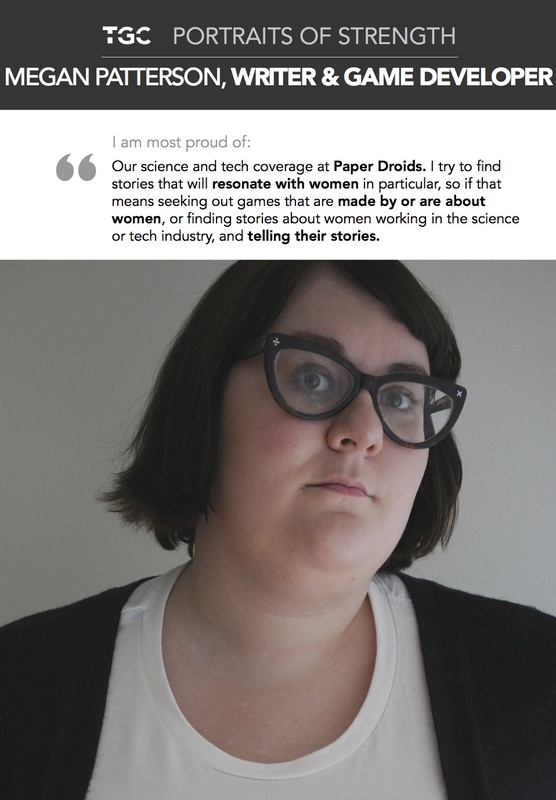 I am proud of our science and tech coverage at Paper Droids. I try to find stories that will resonate with women in particular, so if that means seeking out games that are made by or are about women, or finding stories about women working in the science or tech industry, and telling their stories. The biggest obstacle I have faced was my own self confidence. Like many women, I suffer from pretty massive imposter syndrome! Whether it’s in my writing, or being an editor, or writing and making games, my biggest obstacle has been myself. I just have to push past it and keep doing what I’m doing. My advice to women is never think that you’re not good enough, or that your voice isn’t worth being heard. As women we’re often not socialized to believe these things, but that doesn’t mean they’re not true. We all have something to contribute, no matter what.